USAN provides omni-channel customer engagement solutions that can deliver a seamless customer experience and prevent broken customer journeys. March 18, 2019 – USAN, a provider of cloud-based customer engagement solutions, today announced the availability of Agent Desktop for Amazon Connect and Dialer for Amazon Connect. These solutions, along with Visual IVR for Amazon Connect, comprise USAN Contact Suite, a set of pre-packaged solutions built by USAN to extend the power of Amazon Connect. Amazon Connect is a self-service, cloud-based contact center service that makes it easy for any business to deliver better customer service at lower cost. Now, with USAN Contact Suite, organizations can seamlessly add agent desktop and outbound calling functionality to their Amazon Connect infrastructure. The solutions require no integration effort and work in tandem with other Amazon Web Services (AWS) products, including Amazon Kinesis, Amazon Relational Database Service (Amazon RDS), and Amazon Simple Storage Service (Amazon S3). Amazon Connect and USAN Contact Suite can eliminate the need for on-premises hardware, and customers pay for only what they use. Agent Desktop for Amazon Connect. Agent Desktop unites the power of the AWS ecosystem with the ease and flexibility of Amazon Connect. Agent Desktop allows agents to receive, make, and manage calls on Amazon Connect and supports configurable tabs with context-aware content and embedded websites. Features such as screen pop and call dispositioning, and integration with backend systems, help shave seconds from each call to reduce Average Handle Time. Dialer for Amazon Connect. Dialer adds high-touch outbound calling capability to Amazon Connect in order to boost sales, increase collections, launch surveys, etc. The TCPA-compliant platform can blend inbound and outbound agent activity, and run multiple, concurrent campaigns to reach different target audiences. The system plugs into the organization’s existing list management and CRM systems, and other on-premises databases. In addition, Dialer supports dynamic, automated list processing, configurable call dispositioning, and advanced retry logic. Visual IVR for Amazon Connect. Visual IVR adds omnichannel functionality to Amazon Connect contact flows in order to boost self-service adoption rates and improve customer satisfaction. The solution recreates IVR experiences as an optical, mobile application. It extends IVR menus, prompts, flows, and rules in a graphical format, offering customers another option for how they interact with businesses. One of the first companies to host contact center technology in the cloud, USAN has provided contact center software-as-a-service (SaaS) since 1989. Today, USAN is a Standard Consulting Partner in the AWS Partner Network (APN). USAN helps companies integrate communications and legacy technology and automate business processes to deliver seamless, omnichannel customer experiences. USAN Contact Suite was developed in direct response to customer feedback while providing Amazon Connect integration and implementation services. Visit us at Enterprise Connect, March 18-20, Booth 1536, for a demonstration of USAN Contact Suite. USAN is a Standard Consulting Partner in the Amazon Web Services (AWS) Partner Network (APN), offering design, integration and implementation services for successful Amazon Connect implementations. With years of AWS experience, USAN has a proven methodology for deploying effective and impactful Amazon Connect solutions. Total cost of ownership (TCO) is an important factor to consider when deciding whether or not to migrate your contact center to the cloud. However, unlike a move from one on-premises application to another, calculating the TCO for a cloud-based app is like comparing apples to oranges. At USAN, we’ve helped many clients determine the TCO of moving to Amazon Connect. This is what we’ve learned. When contact centers adopt Amazon Connect, they procure contact center services through a standard browser. The implementation doesn’t require additional hardware or software, so those costs that you’d traditionally incur for an on-premises application are eliminated. There’s no need to install, patch or otherwise maintain the application because it runs on Amazon’s infrastructure. User licenses are also eliminated when you move to Connect, as Amazon charges by the minute as opposed to the number of seats in your contact center. You can easily conduct a proof of concept with a handful of agents and move to production without the costs or operational overhead associated with procuring additional user licenses. Similarly, you can increase your agent headcount during busy periods without worrying about licensing. Ongoing configuration and maintenance efforts aren’t eliminated when you move to Amazon Connect, but they are likely to be lower—especially if you’re already an AWS shop. If you’re not already on AWS, you’ll find the interfaces to be consistent across products and thus require less training to set up and maintain the solution. Finally, implementing Amazon Connect will likely require some data and reporting customization, which will incur some costs. But, you can approach these issues one of two ways: the smart way or the expensive way. Contact centers with little or no experience with AWS sometimes choose to go it alone and rely on in-house resources to figure out how to effectively tailor and optimize their applications. This can result in a much longer project with suboptimal results. An AWS Consulting Partner like USAN can help you design, architect, build and migrate your data and reporting schemas, thereby accelerating the project to realize a quicker return on your investment. Amazon Connect offers the same operational benefits that you’d find with other cloud-based solutions, with the main difference being that now you’re paying your cloud provider for telephony. Whereas companies previously had to reconcile with multiple telephony vendors for one contact center platform, Amazon Connect includes everything on one bill. The entire service is linked together, and it’s clear what the fees are tied to. There’s no need to have someone constantly audit and reconcile your bills. Because moving to Amazon Connect eliminates the need to run hardware and software on-premises, you also don’t need the people to implement, maintain, and replace that hardware and software. Furthermore, there’s no need to buy shelf-ware to ensure scalability during peak periods. Amazon Connect seamlessly scales to accommodate your business demands, such as during end-of-month payments or Black Friday shopping. Thus, you only pay for the services you use, and your operational costs align with your revenue. The feature delivery associated with Amazon Connect differs slightly from that of traditional on-premises applications. Contact centers are advised to consider a roadmap for the features and functionality that they will need in the future and are encouraged to leverage their own innovation. Because of the open APIs afforded by the platform, as well as the AWS ecosystem of services, custom functionality can be realized at a fraction of the price versus that of an on-premises system (if it is possible at all outside of influencing the vendor roadmap). Bottom line: Amazon Connect’s start-up and operational costs can be significantly lower than anything else on the market today. The benefits of moving your contact center to the cloud—eliminating the need to procure and manage hardware, eliminating end user licenses, and improved scalability—make Amazon Connect the TCO winner. When Amazon released its contact center service, Amazon Connect, it was met with skepticism by some industry insiders because it didn’t have the features other solutions offer. After working with the cloud-based contact center service for a little over a year, we’ve seen firsthand the power of Amazon Connect in its simplicity. It’s not that the service isn’t ready for prime time, it’s just a fundamentally different way of solving a problem. Before contact center leaders can embrace Amazon Connect, they need to change how they think about contact center infrastructure. Automatic Call Distributors (ACDs) have been around since the 1970s. Over the years, they have evolved to incorporate a rather large, rigid stack of products and functions that includes workforce management, quality management, IVR, CTI, automatic callback, and many more. Companies tend to buy and integrate these various heterogeneous contact center technologies at different times, resulting in several challenges. Multi-year maintenance schedules that began at different times make it difficult to execute any significant changes to the technology stack. This paired with heavy dependencies results in technology lock-in, which further complicates future integrations. Meanwhile, data silos proliferate across the environment. Each system has its own module and reporting database, making it difficult to extract and analyze data—an increasingly important task as contact centers seek to measure key performance indicators. These issues and challenges related to the ACD and bolted on systems are not easily solved. In fact, solving the problem would require tearing apart the contact center technology stack and starting over from the ground-up. That’s essentially what Amazon has done with Amazon Connect. By deconstructing the contact center, Amazon has reimagined the technology stack in its own way, enabling the cloud service provider to address these challenges head-on. Admittedly, Amazon’s conception of the contact center looks very different from what we’re used to. In order to appreciate the value of Amazon Connect, we encourage organizations to disregard how they currently think about contact center technologies and redefine the contact center within the context of Amazon Connect. Amazon Connect is essentially a core set of tools that organizations can build on and enhance when they’re ready. It provides basic ACD functionality with the flexibility to customize and add “contact flows” and other features to suit your business. There’s no need to wait for a provider’s update or new feature rollout. Because Amazon Connect is an open platform, you can build what you want, when you want it. Amazon Connect has tight integrations with Lex and Lambda, which allows you to customize your configuration in nearly limitless ways, using developer skills that are readily available. Of course, Amazon Connect adopters can also leverage the native functionality of the Amazon Web Services (AWS) ecosystem. You can store recorded calls in Amazon S3 or use Pinpoint to reach out to your callers with additional information after their call is concluded. Finally, with Amazon Connect, your data is your data to do with as you please. It’s easily accessible and reporting-friendly. You can export your data to third-party applications and services or use it within the AWS ecosystem. For example, you can export detailed contact data in real time to either a third-party data warehouse or Amazon Redshift using Amazon Kinesis Streams or Amazon Kinesis Firehose. You can ETL agent and contact data in real-time or in regular intervals, allowing you to leverage computing resources at off-peak times (think EC2 spot instances). By deconstructing the contact center, Amazon has transformed the traditional technology stack with Amazon Connect’s simplicity. Amazon Connect gives contact center organizations the ability to more easily access and utilize their data, more easily integrate with other systems, and customize their technology stack—the very capabilities that were previously difficult to come by. USAN is a pioneer in omnichannel communications and cloud deployments. Our sweet spot lies in combining design, integration and implementation services that convert rigid, siloed environments into dynamic business systems. With years of Amazon Web Services experience and as a certified AWS consulting partner, USAN provides a proven methodology for deploying Amazon Connect solutions. It’s no wonder that “self-service” is one of the first adjectives Amazon uses to describe Amazon Connect. Self-service is quite possibly the most notable difference between the cloud-based contact center service and traditional contact center technology. But self-service doesn’t necessarily mean you should do it all yourself. Let’s look at areas where it behooves you to call in the experts versus areas that can be DIY. Implementing Amazon Connect is nothing like implementing traditional contact center technology. Anyone with an Amazon Web Services (AWS) account can set up an Amazon Connect Instance by simply logging into the AWS Console. You don’t have to issue an RFP, talk to sales folks, or request network services. You can get up and running yourself in a matter of minutes. However, if you want to get the most out of your proof of concept and really run the service through its paces, then we advise taking a different approach. A jumpstart program like the one USAN offers removes internal friction and resource constraints so that you can get your POC up and running quickly. You can then focus on fine-tuning your applications and truly becoming self-sufficient. The traditional ACD is something of a Frankenstein. It’s grown up to be a complex amalgamation of systems, each with its own interface and environment—and its own specialist. As a result, the traditional ACD is only self-service if you have the appropriate skill set. It’s tough to do a feature-by-feature comparison between traditional contact center technology and Amazon Connect because as I stated in my previous blog, Amazon Connect is fundamentally a different way of approaching contact center solutions. If you want to leverage integration capabilities or advanced features, you’ll need help from a developer who is proficient in developing for AWS. Fortunately, finding that help shouldn’t be difficult since Amazon Connect is an open platform. Once you do, you can build out features that are more robust and customized for your business needs. A developer versed in Amazon Web Services can help you leverage AWS Kinesis to analyze streaming data, for example, and Amazon Lex to build chatbots. These technologies have been built out and tested across several industries and use cases, making them powerful components in a contact center technology stack. So, where does that leave you? We suggest you give Amazon Connect a trial run. Give yourself the best chance at a successful POC with a professional implementation. Then start with some basic use cases. Once you realize the value at the entry level, then you can determine whether it’s worth investing in more advanced functionality. When Amazon released its cloud-based contact center service, it was met with skepticism. In a feature-by-feature comparison with any of the existing leaders, Amazon Connect usually came up short. That was a little over a year ago, and much has changed and continues to change when it comes to feature functionality, but we’ll get to that in a future blog. One of the most interesting things we’ve learned is about the infrastructure itself and how the public cloud is transforming the contact center. This is the first in a series of blog posts in which we’ll share observations and the lessons we’ve learned as we became an AWS Consulting Partner for Amazon Connect. Comparing Amazon Connect to a traditional contact center solution running in a private cloud is like comparing apples to oranges. Amazon Connect is a fundamentally different way of approaching contact center technology. Some of this is because Amazon Connect runs on the public cloud, and some of it is because it specifically runs on Amazon’s public cloud infrastructure. 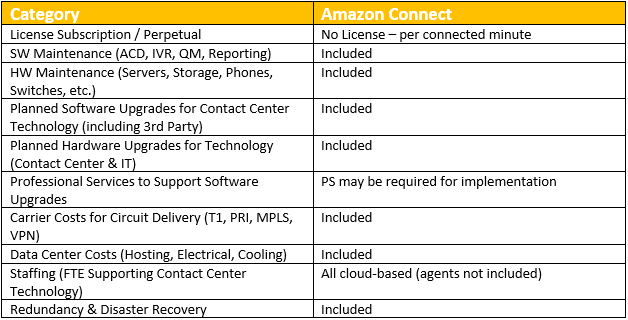 Let’s look at five differences between a private cloud-based contact center and Amazon Connect. The traditional contact center consists of a conglomeration of technologies that are purchased and integrated at different times. As a result, organizations juggle an assortment of multi-year maintenance schedules that create technology lock-in and heavy dependencies. These deep integrations not only create a lot of technical work, but they also put organizations in a weak negotiating position. Amazon Connect changes this dynamic. There are no contracts, no minimum monthly fees, or upfront payments. You’re provided with a set of tools that are open and available to use whenever you’re ready. There’s no lock-in whatsoever: no data lock-in, no integration lock-in, and no contract lock-in. Customers pay by the minute for Amazon Connect usage plus any associated telephony charges. This gives you the freedom and flexibility to adopt new tools and expand and enhance on them at a pace dictated by the business—not another vendor. In an on-premises implementation or private cloud, you must plan for demand spikes and build out the infrastructure accordingly. Because Amazon Connect runs on Amazon’s public cloud, there’s no hardware to deploy or manage. Plus, it’s available on-demand. This makes scalability a breeze. You can quickly onboard tens of thousands of agents and scale back down without so much as talking to a sales person, managing telephony circuits, or sending out an RFP. Amazon does ask that you notify them if you are going to have a significant jump in scale, but, this is a notification not a negotiation. Amazon Connect is an open platform, so you can integrate it with your other contact center technologies. But you can also take advantage of the AWS ecosystem to get more out of your customer and company data. In the traditional contact center, each system has its own module and reporting database, making it difficult to pull data out, compare it, and analyze it. When you use Amazon Connect, you have access to all your data in real time, as well as the tools to make sense of it. For example, you can use Amazon S3 to store call recordings, and control the lifecycle of the data. You can process data in real time with Amazon Kinesis and use CloudWatch to raise an alarm. Because data and applications exist in silos in a private cloud, contact centers are challenged to deliver omni-channel customer service. Each touchpoint operates independently, with its own dataset. Amazon Connect breaks down the barriers between these touchpoints by eliminating the need to integrate separate data silos. All your data in Amazon Connect is available in real time across the entire environment. Setting up a proof of concept in a private cloud can take months and require coordination across multiple departments – contact center operations, IT, procurement, etc. Amazon Connect is more straightforward. The graphical interface, which has a consistent look and feel across the AWS ecosystem, makes it easy to set up and manage. With no hardware or initial coding required, virtually anyone can fire up a basic proof of concept in less than a day. For more complex POC’s, it’s never been easier to engage an AWS Partner. In fact, it’s so easy, there’s no reason not to try Amazon Connect. It wasn’t long ago that companies balked at the idea of moving their contact center to the cloud. It was just too complex and too costly to move all the integrations. In the past year, that perception has changed. The contact center used to be the last thing you’d move to the cloud, but thanks to Amazon Connect, it can now be the first thing. Contact us when you’re ready to make the move. October 23, 2017 – USAN, a provider of cloud-based omnichannel customer engagement solutions, today announced the availability of Visual IVR for Amazon Connect on AWS Marketplace. Visual IVR is a customer self-service solution that seamlessly integrates with Amazon Connect, a cloud contact center platform. With Visual IVR, companies can offer customers another choice in the way they interact with their business. USAN customers today demand service that is fast and easy. Often, that means using self-service options. Unfortunately, some interactions are perceived to be too difficult to handle through an IVR and end up with a live agent, resulting in higher costs and longer call times. Visual IVR for Amazon Connect makes service easier for customers and lifts the load from contact center staff by recreating the IVR experience as an optical, mobile application. It augments IVR menus, prompts, flows, and rules in a graphical format. Companies can use voice prompts to guide customers through the graphical process, as well as mobile web and SMS options to collect and present complex data. With Visual IVR for Amazon Connect, many of the interactions that were considered too hard for IVR become easier. Rich interaction capabilities and improved usability make self-service a viable option for more complex issues. USAN customers therefore “zero out” to agents less frequently, improving IVR containment rates. And with Visual IVR’s Amazon Connect integration, companies using the cloud-based contact center service can take advantage of this enterprise-grade functionality. Since its release in March, Amazon Connect has made it easier for any business to deliver better customer service at a lower cost. Setting up a cloud-based contact center is as simple as a few clicks in the AWS Management Console, and agents can begin taking calls within minutes. Visual IVR is powered by Metaphor Engage, USAN’s omnichannel customer engagement platform. Metaphor Engage integrates communication and backend channels to enable companies to deliver a seamless customer experience across all channels. A built-in integration framework, workflow manager, and adapters connect almost any existing technology and database to unify data and enable companies to consistently deliver personal and relevant service. Metaphor Engage eliminates silos, centralizes business processes, and synchronizes them to work together according to specific business requirements. USAN helps companies profitably engage customers and deliver amazing omnichannel experiences with an industry-leading cloud and hybrid customer engagement solution. From traditional telephone interactions to web-based communications including chat, email, and social, USAN’s portfolio of contact center applications gives businesses infinite flexibility in the way they engage customers across channels. As the original self-service tool, IVR technology has long been a cost savings mechanism. Unfortunately, many organizations today don’t realize that their antiquated IVR solution is actually driving up contact center costs because the options are so limited and the containment rate is so low. So, what can a new IVR do for you? Plenty. Here are just a handful of the many cost saving opportunities that can be realized when you replace your IVR. IVR technology hasn’t stood still. Advanced features and capabilities address rising customer expectations. Conveniently, they also reduce your costs. Take, for example, a capability that isn’t exactly brand new, but has evaded widespread adoption, virtual queuing and call back functionality. Giving customers the option to be called back rather than waiting on hold addresses one of the top complaints customers have about customer service queues: it wastes their time. And by calling customers back, the contact center reduces toll-free costs since virtual queuing doesn’t incur telephone charges. Conversational IVR is another example of advanced IVR functionality. Handling simple queries and transactions via speech recognition software helps you resolve these tasks faster (and for the customer, more naturally) than through a touchtone IVR menu. While older voice-based applications can cause customer frustration, today’s speech recognition capabilities have advanced by leaps and bounds. In addition, the rise of speech recognition software on smartphones has increased customers’ comfort with the technology. Contact centers have to walk a narrow line between streamlining IVR menus and offering enough options to prevent customers from zeroing-out to request a customer service agent. Visual IVR helps address this problem. Contact centers can also offset costs by increasing revenue through upselling or cross-selling. For instance, if you know that a customer is eligible for an increase in a line of credit or that a major life event is coming up, you can use hold times to present related offers to customers. These revenue-generating opportunities are possible with a modern IVR that leverages a context store. The context store is a data repository that holds information pertaining to your customers’ interactions. You can configure the IVR to query the context store after a customer is authenticated, and then generate an applicable offer. The context store also enables you to personalize your customer’s IVR experience by proactively identifying the customer’s need. If the customer’s last interaction was to make a deposit, you might conclude that the customer is calling to confirm whether the check cleared and offer that information automatically, once again reducing call times. The role of the IVR in the contact center has always been to reduce costs, and advances in IVR technology enable it to continue to do so. If your contact center costs are increasing or your IVR is lacking these features and capabilities, it may be time to declare your current IVR dead and look for its replacement. Would you like to learn more? Contact us today. IVR is Dead. Long Live IVR! Some folks in the contact center industry would have you believe that IVR technology is dead. Perhaps you agree, based on your own high opt-out rates and low customer satisfaction scores. In reality, the saying couldn’t be further from the truth. Advancements in IVR are ensuring the technology’s role in the modern contact center. The customer service industry has evolved rapidly over the last ten years or so, and much of the industry’s attention has been on the shiny and new: omnichannel, personalization, web self-service and most recently, Artificial Intelligence. But this same innovation applies to IVR. Providers have evolved their offerings, delivering new features and capabilities that help address current customer service trends. Here are some of the recent advancements in IVR technology that could benefit your contact center – and your customers. Now you can put all that customer data you collect to good use. Modern IVRs allow you to execute sophisticated rules against a context store to determine how to handle specific calls. The context store is a central data repository that stores recent customer interaction steps/actions from multiple channels. These steps/actions are granular in time and detail and allow you to make just in time decisions based on the customer’s past interactions and behavior. Say goodbye to numeric menu options. Customers today can engage with the IVR in a more intuitive and natural way. Speech recognition has advanced to the extent that conversational IVR is a viable option, and visual IVR allows customers to engage through a graphical interface on their mobile device. Telephony-based fraud remains a real risk for contact centers, but call detail records hold valuable clues that can help prevent fraud – if you can find them. A modern IVR can analyze call detail records based on rules and flag details that are indicative of suspicious or fraudulent activity. The ability to measure key performance indicators (KPIs) like call abandonment and IVR containment are key to improving customer satisfaction scores. After all, how do you know what to fix if you don’t know what’s broken? Today’s IVR solutions not only provide analytics pertaining to IVR utilization, they also enable you to drill down into specific IVR interactions to perform root cause analysis and improve upon those KPIs. Contact centers today have more options for their IVR than ever before. Advanced integration capabilities mean that you no longer have to use your ACD provider’s IVR offering. Instead, you can use (and integrate) any IVR that best fits your needs. You also have additional deployment options that can help reduce costs. Secure cloud hosting eliminates the capital expense of running an IVR on-premises while reducing operational expenses associated with ongoing management of the technology. With these advancements in IVR, the question that remains isn’t whether IVR is dead – but whether your IVR is dead. If your IVR technology is missing any of these features or capabilities, it may be time to replace. Would you like to learn more? Contact us today. Let’s face it, there are other technologies in the contact center that are more exciting than your IVR. But despite the rise of other communication channels, telephony remains “by far the largest inbound interaction channel,” according to ContactBabel. That being the case, it’s worth asking, “Is it time to upgrade the IVR?” Here are five signs that it might be time to upgrade your IVR – and the benefits of doing so. You have no visibility into breaking points within the IVR. You can’t fix something you don’t know is broken. If you don’t know where customers are “zeroing out” so that they can speak to a customer service rep, then you don’t know how to improve your IVR containment rate. Modern IVRs provide that visibility as well as IVR utilization analytics so that you can see where containment suffers and even listen to snippets of the IVR interaction to identify the root cause. Benefit: Visibility into IVR utilization enables you to improve containment rates and the return on your investment. Customers hate your IVR. Customers generally don’t care whether their problem is handled by an agent or through an IVR – so long as it’s handled quickly and easily. If your IVR’s operations are based on ten years of rules, confusing menus and logic trees, and paths that go nowhere, then your customers will hate it. But they don’t have to. Modern IVRs enable you to simplify IVR menus and predict why customers are calling. Benefit: Making self-service quick and easy via the IVR improves containment rates and customer satisfaction scores while reducing contact center costs. You bought your IVR at the same time you bought your ACD. There was a time when using a third-party IVR was simply unheard of. Today that’s no longer the case. Integration capabilities have come a long way, and any IVR can easily integrate with any ACD as well as external databases. Benefit: Contact centers aren’t locked into a specific IVR but instead can choose a best-of-breed solution. Your IVR lacks advanced features and capabilities. Modern IVRs offer a variety of features and capabilities that enable contact centers to improve the quality of service they deliver. For instance, machine learning capabilities enable you to predict why a customer is calling. A context store enables you to personalize calls and deliver a true omnichannel experience because you have the entire interaction history at your fingertips. Analytic capabilities enable you to identify and reduce telephony-based fraud by detecting anomalies and patterns in the IVR call detail record. These are just a few examples. Benefit: A modern IVR enables you to more effectively meet your customer service and business goals. Your IVR is running on-premises. The benefits of procuring cloud-based IVR services far outweigh any benefits you gain from running a system on-premises. In addition to reducing expenses, a cloud-based IVR reduces the support and operations burden placed on your IT organization while giving the contact center access to advanced features and capabilities as they become available. Benefit: A cloud-based IVR eliminates capital expenses and reduces operational expenses while delivering the tools organizations need to deliver superior customer service in the 21st Century. Finally – a bonus sign. If your IVR makes you yawn, if you’re not truly excited about the possibilities that are open to you through your IVR, then it’s time to contact us. IVR technology has come a long way, and we’re excited about what it can do for you.